Read eBooks online | World Heritage Encyclopedia | Kerrang! Cover of the 30 March 2013 issue of Kerrang! Featuring (from left to right) M. Shadows, Vic Fuentes, Mark Hoppus, Oliver Sykes, and Billie Joe Armstrong. Kerrang! is a UK-based magazine devoted to rock music, currently published by Hamburg based Bauer Media Group. It was first published on 6 June 1981 as a one-off supplement in the Sounds newspaper. Named after the onomatopoeic word that derives from the sound made when playing a power chord on a distorted electric guitar, Kerrang! was initially devoted to the New Wave of British Heavy Metal and the rise of hard rock acts. In the early 2000s it became the best-selling British music newspaper. Kerrang! commenced publication on 6 June 1981 and was edited by Geoff Barton, initially as a one-time supplement in the Sounds newspaper, which focused on the New Wave of British Heavy Metal phenomenon and on the rise of other hard rock acts. Angus Young of AC/DC appeared on Kerrang! 's first cover. Launched as a monthly magazine, Kerrang! began to appear on a fortnightly basis later, and in 1987 it went weekly. The original owner was United Newspapers who then sold it to EMAP in 1991. During the 1980s and early 1990s the magazine placed many thrash and glam metal acts on the cover (like Mötley Crüe, Slayer, Bon Jovi, Metallica, Poison, and Venom) but later discarded them when grunge acts such as Nirvana rose to fame. Readers often criticise the magazine for repeating this process every time a new musical trend becomes popular. Kerrang! 's popularity rose again with the hiring of editor Paul Rees circa 2000 when the nu metal genre, featuring bands like Limp Bizkit and Slipknot were becoming more popular. Rees went on to edit Q magazine and Ashley Bird took over as editor from 2003 to 2005. However the magazine's sales went quickly into decline in 2003 and Paul Brannigan took over as editor in May 2005. The term "Thrash Metal" was first referred to in the music press by Kerrang journalist Malcolm Dome while making a reference to the Anthrax song "Metal Thrashing Mad" in issue number 62, page 8 published on 23 February 1984. Prior to this Metallica's James Hetfield referred to their sound as Power Metal. With the emergence of emo and metalcore, Kerrang! began to heavily feature this musical trend. 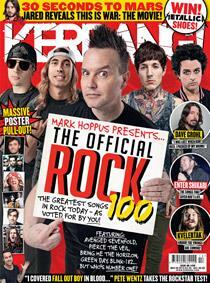 However, the revamp was not welcomed by all readers and many complaints were received about Kerrang! 's sudden emphasis on emo and metalcore music. Brannigan took the magazine into its most commercially successful period with a record ever ABC for the title of 80,186 copies. In 2008, EMAP sold its consumer magazine to current owner Bauer Media Group. Brannigan left Kerrang! in 2009 and Nichola Browne was appointed editor. She later stepped down in April 2011. Former NME features editor and GamesMaster deputy editor James McMahon was appointed as editor on 6 June 2011. 'Kerrang! ''s website, www.kerrang.com was launched summer 2001 by Dan Silver. Kerrang!’s parent company Emap acquired the domain name from a Norwegian cybersquatter by the name of Steingram Stegane for a token sum of £666. Kerrang! 's website is dedicated to finding out more information to do with the magazine and also the latest information on the current bands and upcoming events. The website hosts Kerrang! 's online shop, podcasts, message board, TV and radio segments ensuring even more opportunities to sell associated merchandise and products. In 2001, Kerrang! launched its own online forum with the "rants and raves" section taking up most of the traffic. Though initially extremely popular, the number of users began to peter out around 2005 with the number of people online dropping to as low as 10 when previously it had been closer to the 100 figure. According to Alexa www.kerrang.com generates 60,000 pageviews per month and is ranked 66,798th globally. Since 1993, the magazine has held an annual awards ceremony to mark the most successful bands in the interests of their readers. The awards became one of Britain's most recognised events by the now defunct Guinness Book of British Hit Singles & Albums, often listing some of the winners in their annual round-up of the previous year. The event is presented by major music celebrities, with many others outside the industry who attend the event. In 2000, EMAP launched Kerrang! as a digital radio station, across the United Kingdom. This was principally a 'jukebox' station, playing a back-to-back sequence of rock and alternative music. On 10 June 2004, Kerrang! 105.2 was launched as a regional radio station in Birmingham with an advertising campaign by London-based creative agency ODD. The radio had a number of specialist programmes dedicated to the many subgenres of rock music. The radio output included interviews with those affecting popular culture and society as well as those involved with music. It stopped broadcasting on FM as of 14 June 2013 and once again became a digital station, with listeners able to tune in on DAB or the Kerrang! Radio app. With this broadcasting change came a move in Kerrang! Radio's offices from Birmingham to London. Planet Rock is now broadcasting on its FM frequency. In 2001 EMAP launched Kerrang! TV. As with the radio station, the television channel covers the more mainstream side of the rock music as well as classic rock bands like Aerosmith and AC/DC, and classic heavy metal bands such as Guns N' Roses and Metallica. Kerrang TV is now a joint venture between Bauer Media Group and Channel 4. Kerrang! held throughout January a tour of rock music concerts around the United Kingdom. The tour has featured bands such as Bullet for My Valentine, Good Charlotte, Sum 41, and Coheed and Cambria among others. Although the 2012 Kerrang! Relentless Energy Tour had billed Sum 41, New Found Glory, letlive. and While She Sleeps to play, unfortunately Sum 41 had to pull out due to a back injury of their frontman. They were promptly replaced by The Blackout. In March 2012, Kerrang announced a new rock chart for the UK which is based upon airplay across Kerrang Radio, Kerrang TV and sales figures from the Official Charts Company. Charts are announced on Saturday mornings and feature twenty tracks. The latest chart can be viewed on Kerrang! every Saturday at midday. Emap launched Kerrang! Australia in the late 1990s. Unlike its weekly counterpart in the UK, the Australian edition was published monthly due to stiff competition from free local music publications. Kerrang! is also published in Spanish and German. ^ "ABC". Audit Bureau of Circulations. Retrieved April 17, 2015. ^ Baran, Pete (15 February 2002). "Kerrang topples NME as best selling music weekly". Freaky Trigger. Retrieved 23 November 2011. ^ Ward, Steven. "Geoff Barton, behind the wheel". Rock Critics. Retrieved 22 November 2011. ^ "Kerrang! overtakes NME". BBC News. 15 February 2002. Retrieved 7 May 2010. ^ "ABC report: film and music". ^ Dome, Malcolm (23 February 1984). "Anthrax 'Fistful Of Metal'". Kerrang! 62. London, UK: Spotlight Publications Ltd. p. 8. ^ Cardew, Ben (6 June 2011). "Kerrang! names new editor". ^ "Site Overview". Alexa. Retrieved April 17, 2015. ^ Ng, Justin (4 May 2011). "Kerrang! Awards Fuelled By Relentless Energy Drink Nominations Announced". Entertainment Focus. Retrieved 22 November 2011. ^ Gregory, Jason (28 September 2011). "New Found Glory, Sum 41, letlive For 2012 UK And Ireland Tour – Tickets". ^ "The Kerrang! Tour 2012 sponsored by Relentless Energy Drink featuring New Found Glory and The Blackout".